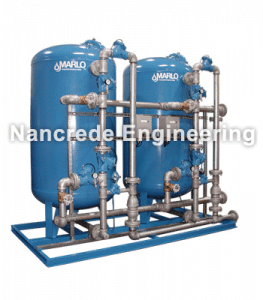 Can be used with numerous industrial water filter technologies. Designed for larger commercial and industrial applications with multi-tank parallel systems common for high flow rates. Tank diameters up to 144″ and service pipe connections to 8″ flange are available. Galvanized steel face-piping assembly with cast iron, normally-open, “Y” pattern diaphragm control valves. Filters with service piping 6″ and larger utilize flanged carbon steel face-piping and double-acting butterfly control valves. Pilot stager valve controller for automatic backwash operation. Pre-wired in a NEMA-12 enclosure with an adjustable timeclock for backwash initiation. PVC media-retaining underdrain distribution system in either hub-radial or header-lateral configurations for minimal pressure drop and proper backwashing. Sch 80 PVC face-piping and thermo-plastic diaphragm valves (1-3″ service). Manual system valves for operator-performed backwash cycle. Air-scour backwash systems (for high particulate applications). Steam or hot water sanitizable systems (for ACA filters).